Ilya Repin, a world-famous Russian artist who does not require representation, was famous for his preparatory paintings, which testified to his particular approach to his beloved work. Even after the artist’s death, many preparatory sketches for his famous paintings were found. The painting “The Hunchback” of 1881, was also an etude to his famous painting “The Procession of the Cross in the Kursk Province” 1880-1883 year. The writing of “The Hunchback” was not easy for Repin, as he had been looking for a man who would fit this role for a long time, and nevertheless found him in Khotkovo, a place where he had often been an artist when he painted. The artist has painted the Hunchback many times in various poses, which is strange, because in the painting The Procession of the Cross in the Kursk Gubernia, the hunchback is one of the pivotal characters. The author wanted the young man with a hump, to embody poverty and at the same time an iron will and strong spirit, these qualities were necessary for the picture mentioned above, since in that picture a lame hunchback who leaned on a stick would strike the village headman. The charisma of the hunchback clearly distinguishes him from the crowd. Do not assume that “The Hunchback” served only as a missing detail to the painting “The Procession of the Cross in Kursk Province”. 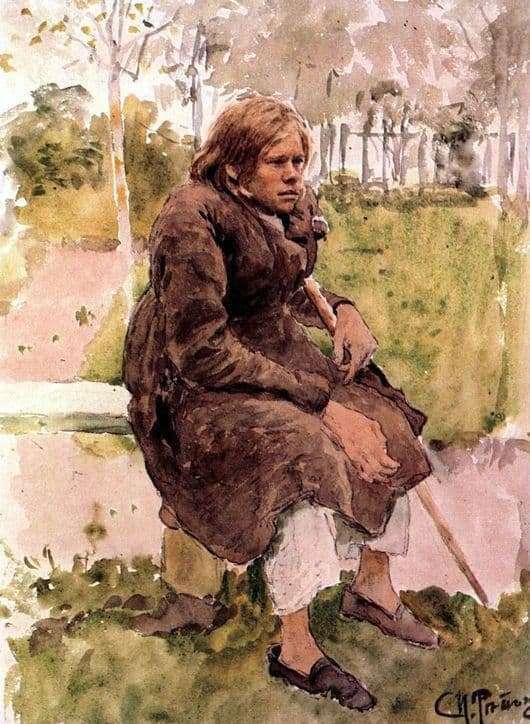 The young man’s deep thoughtful look, as well as his physical defect in the form of a hump, symbolizes a whole layer of society in Russia at the end of the 19th century, no one ever listened to the opinions and needs, but they all actively participated in the public life of the cities, having their own independent opinion. Considering all the moral qualities of a young man with a hump, as well as his extraordinary, charismatic appearance, the picture “The Hunchback”, must be analyzed separately, as another masterpiece of the great Russian artist. Repin as if completely opens the soul of his hero and shows his experiences.